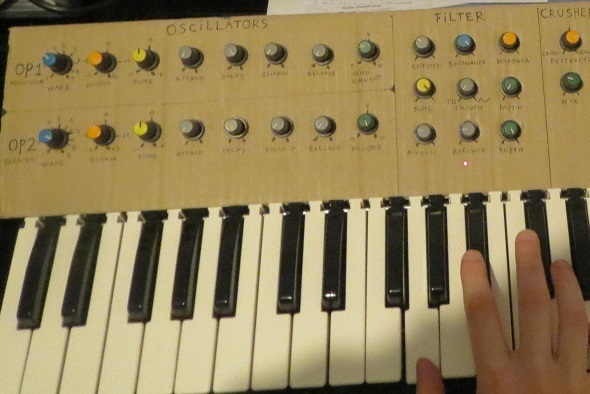 It uses an Arduino Mega for the controls and for the FM Synthesis. Needless to say I squeezed every clock cycle out of the poor Atmega processor but it was great fun to do so! The Arduino's output signal goes through several analog circuitry such as an VCF and distortion. You can find the demonstration video here. I've also made a VST plugin version which you can find here. This plugin is based on the final version of SQK-01, not so much this prototype. This page is unfinished and I'll probably never bother to complete it as this was just an idea prototype. The final version of SQK-01 uses entirely different hardware and thus will have its own page! There's a LOT of code in this project so I'm not going to put it -all- on this page, just snippets to go along with my explanation. The Arduino project files can be downloaded here. I advice you to have a look at the project files first so you can get a general idea of the structure. This code is obviously outdated now as I'm working on a final version of the SQK-01 (the one this page is about is just a prototype!). This final version will use an Arduino Due for more power and better audio quality as well as my improved Twin-T circuit design. I also have a neat stereo chorus design and a rather expensive reverb circuit that I'm going to implement in this final build. The user interface is also -much- better, with knobs, buttons with indicator lights and a 3-digit seven segment display. I think this is the circuit topology I used for the filter and AR envelope. It's a Bridged T resonant filter, one of my favorites. Stupidly, my collection of schematics for the SQK-1 are a mess, so I need some time to make everything neat, updated and sorted out. I do think this could work, though I'd use 100k to 1M resistors instead of 10k on that transistor base. Op amp is powered by 12V single rail, hence the resistor-divider on the non-inverting input to act as a virtual ground at +6V. The LFO is a simple 40106 oscillator, with a simple passive low pass as an integrator to get a sort-of-triangle-ish-waveform.